Bespoke glass furniture – the only limit is your imagination! Here at Tufwell, we love getting stuck into a new creative project. Whether it’s realising an architect’s vision for an eye-catching high-rise façade or supplying the glass for a craftsman’s bespoke piece of furniture, it’s always a pleasure to be involved in creating a unique design. Even better is seeing the finished product in all its glory. So it was a real pleasure to see this beautiful piece come to life. 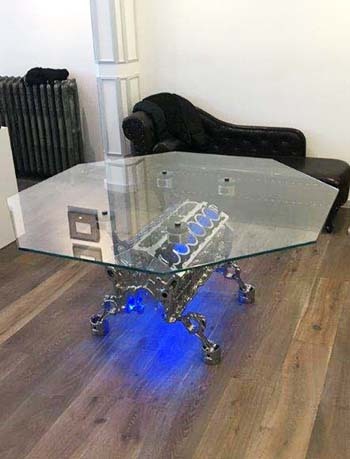 Our client’s concept was to create a unique piece of bespoke glass furniture incorporating an old Jaguar engine that had come into his possession. The engine was polished up and fitted with feature lights to enhance it. Tufwell then supplied the toughened glass cut to size. The glass sits without a frame on the table, so in order to ensure optimum strength, durability and safety, we used 12mm toughened glass. Thanks to our computer numerically controlled (CNC) cutting service, we are able to accurately and precisely cut glass to any shape required, in thicknesses up to 19mm, so creating the octagonal profile of the table was no problem. After four bolt holes were drilled, the glass was then toughened and polished ready for mounting onto the Jaguar engine. The resulting piece is quite striking and makes for an incredibly effective focal point. If you have an idea in mind for a piece of bespoke glass furniture, get in touch with the Tufwell sales team today and find out how we can help you realise your concept too.